COREY DEUEL has been a mainstay in our monthly spotlight on some of the greatest single shots in recent history. One of the most creative players in the game, he sometimes gets lost in his own mind - like when he tried the medium-strength one-pocket break that spread balls across the table. But this month's shot - from August's Accu-Stats 8-Ball Invitational, where six world-class pros matched up in a round-robin event - was simple. And simply great. Facing Johnny Archer in a race to 8 on a 10-foot Diamond table, Deuel fell behind early and had a narrow margin for error with the score at 6-3. 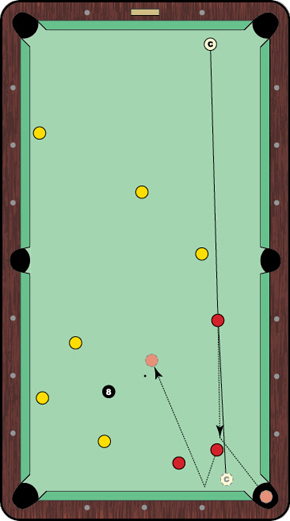 With Archer shooting at the yellows - the Accu-Stats event used English 8-ball-inspired yellow and red balls instead of the traditional stripes and solids - he played safe to leave Deuel in the situation shown here. The cue ball is inches off the head rail, where he can see a bit of the red ball near the side pocket. But Deuel doesn't have an angle that allows him the full-table shot into the bottom right corner. Kicking at one of his three balls was one option. But Deuel came up with a more direct solution. Elevating his cue and loading up on right English, he used a slight "twirl, as commentator Billy Incardona called it, that just barely changed the path of the cue ball, allowing it to hit the first red nearly full. The object ball then kissed off a second red before dropping in the corner pocket. He easily cleared the last three balls to take the rack. Not only that, Deuel took the next three games for an impressive 8-7 comeback victory, a win enabled by a tremendous kick shot in the case game that left him in perfect shape for the clinching 8 ball.